Greg Billing began covering high school, college and professional sports in the Miami Valley in 1988 when he was a junior at Miami East High School. The Wright State University graduate has worked at the Troy Daily News (1996-1997), Springfield News-Sun (1997-2001) and the Dayton Daily News (2001-2016). He was inducted into the Dayton Auto Racing Fan Club's (DARF) Hall of Fame in 2015 for his auto racing coverage and has also earned numerous Associated Press awards for stories, headline writing and special sports sections. Greg lives in West Milton with his wife and two daughters. When not covering events, he and his wife are cheering for the girls as they play a variety of sports for the Milton-Union Bulldogs. 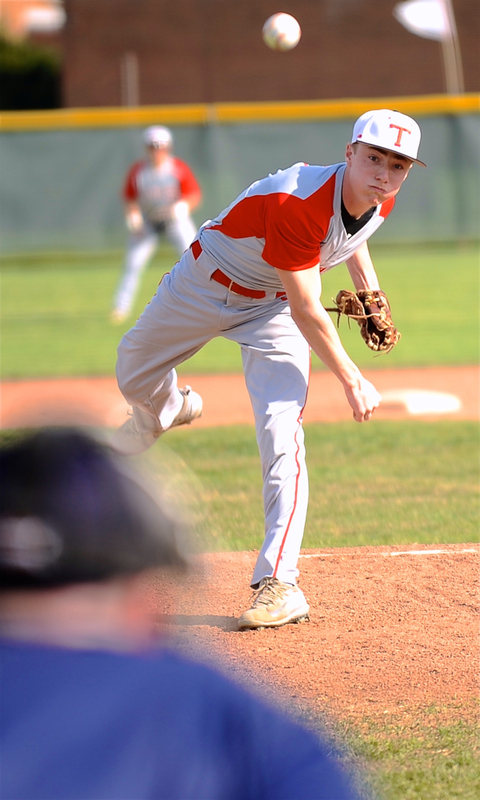 Pitching depth has Tippecanoe as contender in the GWOC and beyond. On Friday it was Mason McClurg’s turn to throw teams for a loss. Tipp City – On most other teams, as his stats suggest, senior pitcher Mason McClurg has potential as a No. 1 or No. 2 starter. But these days the Tippecanoe Red Devils are, well, strong armed and dangerous. McClurg, who is tied for ninth in the Greater Western Ohio Conference in both wins (2) and strikeouts (20), shut down West Carrollton with a stellar effort on Friday. He tossed a three-hit gem with 12 strikeouts in Tipp’s 10-2 win at Clawson Field. Not bad for a No. 4 starter, who will drop to No. 5 when open-enrollment transfer Kenten Egbert becomes eligible to play after the Red Devils’ 13th (and next) game this season. So will McClurg lobby Tipp coach Bruce Cahill for more starts after improving to 2-0 with a 1.87 earned-run average? Tipp (11-1 overall, 5-0 in the GWOC American North Division) has quality starters in senior Zach Losey and junior Ian Yunker. Losey is 3-1 with a 1.15 ERA and 23 strikeouts in 18.1 innings. Yunker is 3-0 with a 0.46 ERA and 23 strikeouts in 15.1 innings pitched. First baseman Josh Riebe takes the throw on a pick-off attempt. Senior Seth Clayton, the team’s regular shortstop, is an equally impressive 3-0 with a 0.42 ERA in 16.2 innings. Cahill said he doesn’t throw hard as his six strikeouts attest, but he “locates the ball like crazy” for ground ball outs. Fellow senior Troy Powers has pitched in 6.2 innings of spot duty with an ERA of 5.26 and eight strikeouts. And then there’s Egbert, who came over to Tipp from Bethel. On Friday all they needed was McClurg. He struck out eight of the first 10 batters he faced. 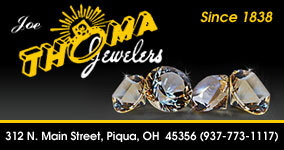 The Pirates (2-7 overall, 2-2 GWOC American South Division) were held without a hit until the fourth inning. They connected for back-to-back singles and scored their two runs with the help of a hit batter, a couple of errors and a walk. The fourth inning was the only blemish on McClurg’s otherwise spot-on performance. Miles McClurg attempts to get down a bunt in the first inning. 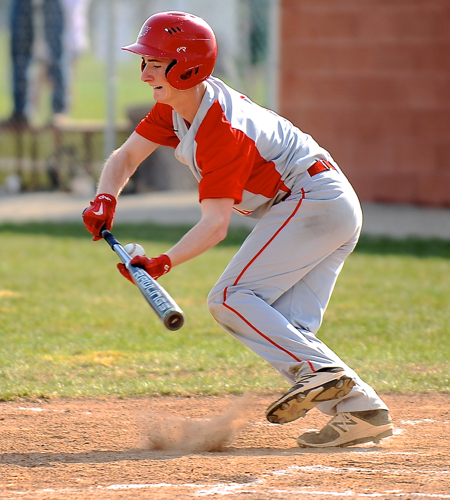 Tipp pounded out 11 hits of West Carrollton pitching, including starter Tyler Hunt (0-1, 8.66 ERA). The Pirates helped the Red Devils with 10 walks, too. Seniors Miles McClurg and Josh Riebe and sophomore Cade Beam had two hit each. 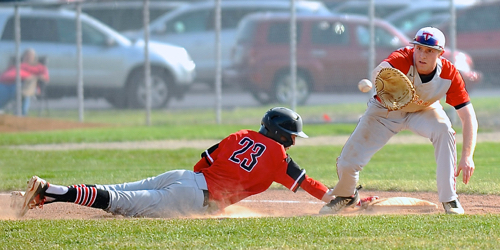 Riebe, Losey and junior Brad Dettwiller all knocked in two runs for the Red Devils. Eight different players scored including twice each by Cole Barhorst and Mason McClurg. Senior Clay Barhorst had the defensive play of the game when he laid out head first for a diving catch to end the fifth inning with a runner on base. The win was a shot in the arm, so to speak, for Tipp following Thursday night’s 11-1 loss to Chaminade Julienne (2-3). The loss was especially rough on Barhorst and his brother Cole – their uncle Mike Barhorst is the Eagles’ head coach. Cade Beam gives Moose Ears to his teammates in the Tippecanoe dugout after belting a second-inning double. On Friday, Tipp led 1-0 in the first against West Carrollton and didn’t stop. The Red Devils also led 1-0 against CJ before falling. This time the Red Devils kept rounding the bases with two runs in the third, one in the fourth and three more in both the fifth and sixth innings. They stranded 10 runners overall including leaving the bases loaded in the fourth and fifth innings. Tipp sits tied with Butler (8-4 overall, 5-0 GWOC) for second in the American North. Both are one game back of Troy (7-3, 6-0). Troy and Butler play a big two-game series Monday and Tuesday. Tipp, meanwhile, doesn’t face Troy until April 23-24 and Butler until April 30 and May 1.